Define the benefits of utilizing parametric design and advanced engineering to maximize the potential of digital manufacturing. Identify the difference between computer-aided design and computer driven-design, the latter of which uses utilizes data parameters to achieve high-performance goals for health, safety, and welfare. Employ new strategies for increased daylight and to reduce artificial lighting requirements through partnership with designers utilizing parametric model-based design analysis. Optimize sound absorption and acoustic “tuning” in buildings through the use of predictive modeling in initial design phases. Discuss the potential parametric modeling and digital manufacturing has to reduce waste, improve efficiency, and deliver higher-quality results beyond the abilities of traditional manufacturing paradigms. Inspired by the talent of young graduate architects and fueled by advances in computing, the integration of design with automated fabrication is changing the nature of building. One of the most influential architects of the 20th century, Buckminster Fuller often predicted the future. “In order to change an existing paradigm, you do not struggle to try and change the problematic model,” he said. “You create a new model and make the old one obsolete.” As technology has progressed, his words can be applied to the latest advances in computer-assisted design and manufacturing. Through exploration with digital fabrication using computer numeric control (CNC) machines, numerous architectural schools are now training architects to become the makers of the building shapes that they are designing using parametric modeling software. A parallel movement in manufacturing is merging with this design trend. As both worlds collide, they are learning to collaborate in the construction of affordable, mass-customized, high-performance buildings. 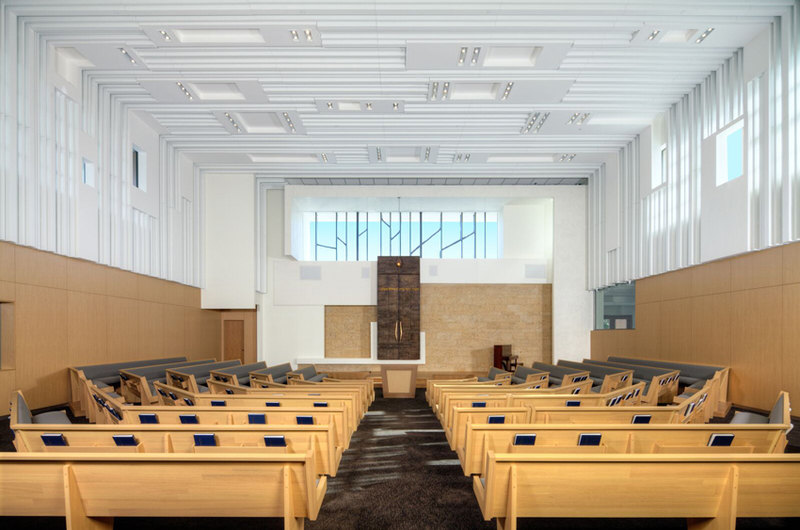 This complex, high-performance acoustic ceiling at the Temple B’nai Israel was designed and fabricated using revolutionary digital processes and collaborations between architects and manufacturers. Within the past 30 years, the traditional practice of architecture, with its formal renderings of schematic, design development and construction documents by pencil, has been transformed by the use of computers. In the 1990s, architects began to develop new ways to document buildings, using computers instead of hand drafting plans, sections, and details. The ability to quickly manipulate and change drawings to meet ever-shorter schedules led to the standardization of construction documents. A few architects, like Frank Gehry, began to investigate the possibilities of new design opportunities, borrowing software used by designers of airplanes and automobiles to develop new forms that were then sent directly to a manufacturer for digital fabrication. New three-dimensional software provided enhanced opportunities to design complex forms. Unfortunately, the construction of these forms often required significant amounts of time and money, as these revolutionary visions were translated to the limits of existing technology and common construction practice. As described by Erik Luhtala, former architectural instructor, now the manager of Advanced Computational Research at Ceilings Plus, “The traditional relationship from architect to manufacturer is typically a top-down structure. The architect conceives the design, and the manufacturer delivers the finished goods. During the development phase, there is often consultation on material, feasibility, cost, finish, and details, but the manufacturer is often responding by matching the needs of the architect to products and solutions within its existing arsenal. This traditional relationship is successful, but due to the limitations of the exchange, there is often little room for completely new solutions or a fully collaborative approach.” Today, new digital fabrication tools and collaborative approaches are creating a design revolution. A new process of digital manufacturing and fabrication aligned with parametric design tools at architectural firms are generating mass-customized building materials from interior finishes to exterior facades. 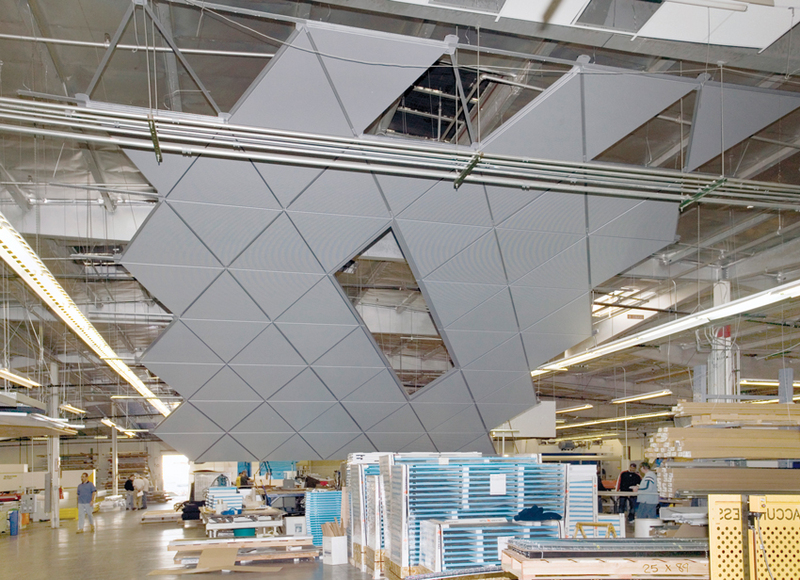 Leading architectural firms are partnering with manufacturers to utilize parametric software and digital fabrication tools. They are crafting new solutions for projects without inducing additional cost or delayed delivery. They are consulting with professionals with new 21st century job titles like Luhtala’s. Mass-customization allows architects to achieve customized solutions that deliver the capabilities of advanced engineering and digital manufacturing to every aspect of their project. The change is transforming the marketplace and allowing designers to meet ever more stringent environmental goals for energy efficiency, daylighting, air quality, acoustics, and material reductions. 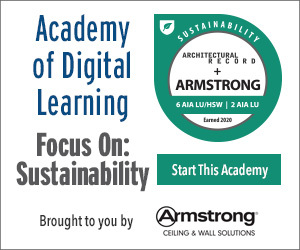 This course will highlight how designers from several architectural firms (SmithGroup JJR, HKS, Gensler, and SGR Partnership Inc.) are changing their firms’ design processes and meeting targeted cost, branding initiative, environmental, health, safety, and welfare goals through mass customization of project ceilings and wall systems. Parametric design combined with digital manufacturing and fabrication allows for the use of increasingly complex technological interfaces and modeling of aesthetic and environmental strategies. In the seminal book, Advanced Customization in Architectural Design and Construction, the authors describe the evolution of advanced customized industrialization as a development supported by various evolutionary factors. These include “the use of increasingly complex technological interfaces, the intent to characterize architectural language, the search for improved performance and increased levels of flexibility over time, the need to minimize construction time and rationalizing the organization of activities within the site, and last but not least, taking into account the issues related to sustainability and ecology.”1 They describe a new method of designing that is process oriented. This process is related to the evolution of “digital technologies that enable a more direct interface from the design, thanks to parametric software and production modalities, nowadays realized by flexible CNC machines.”1 The key is not only to select the appropriate technology but also to define the conditions for design and technological material transfer to the construction process. The first wave of computer-assisted drafting tools allowed the architect to complete a set of drawings in two dimensions. These static drawings, similar to those developed by hand, were produced to specify finishes and processes for the construction of a building. These drawings provided computer-aided documentation given to manufacturers to provide a cost estimate and as a guide for shop drawings. Variations on these early programs included the addition of smart tags by the architect that calculated materials and environmental quantities and qualities. Advanced programs led to three-dimensional computer models that allowed designers to investigate the collisions between components but did not generate component fabrication. Today, architects employing new parametric digital tools are leading a change that is revolutionizing not just the ability to model variations on paper but evaluate parametrically the impact on materials from concept through fabrication.